The moving coil instrument has a Full Scale Deflection of 20-0-100µA, 20-0-100mV. Diodes are fitted to provide protection against overloads. For ease of reading, the instrument is fitted with an internal scale of 60 divisions over which interchangeable transparent scale slides – displaying figures only – are fitted externally into the dial recess provided. 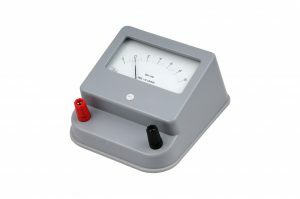 A scale slide is available for each range of voltage and current so that the instrument can always indicate the correct range in use at any particular time. Scale slide ranges available are: 0.2-0-1, 1-0-5, 2-0-10, 5-0-25, 10-0-50, 20-0-100 and 100-0-500. The instrument can be used as a DC voltmeter by incorporating plug-in voltage multipliers in conjunction with appropriate scale slides to allow students to measure voltages on external circuits. The voltage multipliers are designed to give a resistance of 10,000 ohms per volt, giving ranges of 1V, 5V, 10V, 25V, 50V, 100V and 500V for DC. With the exception of the 1V range, the same ranges are available for AC measurement. Similarly, the instrument can be used as a DC Ammeter by incorporating plug-in Current shunts. The shunts are available for 1mA, 10mA, 50mA, 100mA, 500mA, 1A, 5A and 10A. For alternating current measurements the A/SM302 unit can be used.